Sweet potatoes are very delicious, healthy and are easy to cook and that’s what makes it my favorite snack. From casseroles to pies and fries, sweet potatoes dishes are myriad and delicious. And if you are looking for a magical, healthy and delicious staple food that can be cooked quickly and easily, you got to choose sweet potatoes. Sweet potatoes are rich in Vitamin A, omega-3 fatty acids, carbohydrate and contain various other essential nutrients. Some of the health benefits of eating sweet potatoes include its ability to protect against cancer, treat inflammation, bronchitis, arthritis pain, dehydration, diabetes control and improved digestion. Baked sweet potatoes are my favorite weekend snacks and if you have not included it in your diet, then maybe you should. Today in this post, I am going to share with you the top 15 surprising health benefits of eating sweet potatoes and why it should be in your day to day diet. The tubers of sweet potato are distinctively different from that of a potato. Sweet potato is from the bindweed or morning glory family while potato is from the nightshade family. Because of the etymological similarities between the two tubers, the common name of Ipomoea batatas is ‘sweet potato.’ Although, sweet potato is often, called ‘yam’ it will be a grave mistake if you think both are the same. These are botanically very different from the original yam, Dioscorea. Sweet potatoes are available in different colors ranging from white to pale yellow to purple or red. The rich dark colors of sweet potatoes are, perhaps, due to the presence of abundant beta-carotene. While the yellow or white varieties are juicier, the red or purple ones boast rich aroma. The darker the shade, the richer is the aroma. Sweet potatoes are damaged by frost and require plenty of sunshine and warm nights to grow and develop properly. According to data published by Food and Agricultural Organization in 2011, the world production of sweet potatoes was 106.5million tones led by China with a production of 81.7 million tones. India was the 7th largest producer with a whopping amount of 1.1 million tones. Another interesting fact about this particular herbaceous perennial vine is that, according to a study conducted by scientists of Ghent University and International Potato Center in 2015, sweet potatoes contain transgenes. This makes sweet potatoes the first known example of a naturally transgenic food crop. Please note that the percent daily value (%DV) is for children aged 4 or above and adults. They are based on a 2000 calories based diet and your daily values may be lower or higher depending on your personal requirements. As you already know, sweet potatoes are an excellent source of Vitamin A, Vitamin C, Manganese, Vitamin B6, Potassium and Dietary Fiber. Every baked with skin on and without salt 200g of sweet potatoes contain only 0.1g of saturated fat and 72mg of Sodium (3% of DV.) These vegetables are very low in saturated fats and sodium and that makes it even more beneficial for our health. Sweet potatoes are better than potatoes since they are more nutrient dense, low in carbohydrates and calories and keep you satiated for a longer time. Sweet potatoes are versatile and they taste good pureed, roasted, grilled or baked. There are a number of health benefits of eating sweet potatoes and here are the top 15 health benefits of eating sweet potatoes. Vitamin A is the most abundant nutrient present in sweet potatoes, which makes it significantly vital for enhancing our immunity. Vitamin A is responsible for stimulating the production of white blood cells that fight diseases and infections. Studies say, Vitamin A eliminates cells that are detrimental to our health and has been shown to have anti-tumor qualities in some animal studies. Studies reveal, Vitamin A supplementation in areas where there is widespread deficiency of it, can aid in reducing the risk of death due to infectious diseases. Foods rich in Vitamin A like sweet potatoes, apricots, carrots etc. are immensely important to keep our immune system working smoothly and to its full extent. Additionally, the abundant antioxidant beta-carotene, iron and phosphorus also work towards boosting the functions of your immune system. So, if you have weaker immune system and looking for easy and natural way to boost your immune system, then eating sweet potatoes can be seriously beneficial for you. Not only your immunity, Vitamin A is also responsible for boosting your eye health and that’s another major benefit of eating sweet potatoes. Vitamin A deficiency leads to deterioration of the outer segments of the eye’s photoreceptors, which impairs normal vision. Vitamin C, Vitamin E and omega-3 fatty acids are also healthy for the eyes and prevent degenerative damage. The beta-carotene present in the sweet potatoes keeps away age-related macular degeneration and that’s a good enough reason to include sweet potatoes n your day to day diet. Sweet potato has high water content that raises the water level of a dehydrated body. In addition, the roughage or fiber present in the vegetable retains water in the body and keeps you well hydrated. If you often feel dehydrated then may be eating sweet potatoes can be beneficial for you in keeping your body hydrated for longer hours. According to this study, purple sweet potato extracts prevent oxidative damage in the brain, improved memory and enhanced cognitive functions. Yet, another animal study showed that purple sweet potato extracts helped against brain aging and refined memory ability and special learning in mice. The anti-inflammatory qualities of sweet potatoes ameliorate memory and even prevent Alzheimer’s disease and that is another benefit of eating sweet potatoes. Sweet potatoes have a calming effect on the intestines and stomach. Potassium, Calcium, Vitamin A, Vitamin C, beta-carotene – all these are efficient in curing stomach ulcers. The roughage in sweet potatoes averts constipation and the resultant acid development, which diminishes the risk of stomach ulcers. The anti-inflammatory properties of sweet potatoes reduce the inflammation and pain of such ulcers and hence eating sweet potatoes is highly beneficial in treating stomach ulcers. Sweet potatoes are known to reduce elevated blood sugar levels. In one study, 61 diabetic patients were given either 4g of Caiapo or a placebo daily for three months. Caiapo is a variety of white sweet potato, which has been studied extensively for its anti-diabetic qualities. At the end of the research, it was found that the sweet potato group had notably lower blood sugar level than the control group. If you are working out and planning to lose weight, then eating sweet potatoes can seriously benefit you. Sweet potatoes are rich in dietary fiber that keeps you full for a longer stretch of time and reduce your food cravings. Fibers move slowly through the digestive tract, which keep you satiated and keep away the hunger pangs. Eating a cup of sweet potatoes provides you with almost 7g of fiber. According to a recent animal study, purple sweet potatoes are excessively good in aiding weight loss. Mice were, kept on a high-fat diet and were, supplemented with purple sweet potato, which were, shown to decrease body weight and accumulation of fat over a period of 12 weeks. For maximum weight loss effect, maintain a healthy diet and exercise regularly, aside from adding sweet potatoes to your diet. Sweet potatoes have the capacity to bring up the body temperature, perhaps due to their sweetness content. This ability of sweet potatoes is advantageous for people suffering from bronchitis along with its added property to act as a de-congestant. The concentration of Vitamin C, iron and other nutrients aids in treating bronchitis. Since sweet potatoes are good against bronchitis, they are a good treatment against asthma as well. They are helpful in curing congestion of nose, bronchi and lungs, thereby relieving the symptoms of asthma. Sweet potatoes are rich in anti-oxidants besides being an excellent source of roughage, vitamins and minerals. Orange colored sweet potatoes are high in beta-carotene, which is a pigment responsible for their vibrant orange hue. Beta-carotene is a powerful antioxidant that helps improve vision, promote respiratory health and is good for your skin. (Source: 1, 2, 3) According to research, colored sweet potatoes display more influential activity against free radicals than white sweet potatoes and purple potatoes. The high concentration of beta-carotene, Vitamin C and magnesium is helpful in reducing both internal and external inflammation. This property is common in both potatoes and sweet potatoes although they belong to different biological families. Sweet potatoes are high in dietary fiber and magnesium, which makes them a brilliant facilitator of digestion. Since they mainly contain starch, they are quite easy to digest and have a soothing effect on intestines and stomach. Since sweet potatoes are beneficial against inflammation, they are also beneficial in fighting against the swelling, pain and inflammation related to arthritis. The beta-carotene with magnesium along with zinc and Vitamin B, make sweet potatoes a very efficient food for treating arthritis. Beta-carotene neutralizes the free radicals produced at the site of inflammation. Painkillers like ibuprofen increases the risk of heart failure by 20%, so abandoning drugs for natural remedies to cure arthritis pain might be a good idea. Almost 80% of sweet potatoes are, filled with a protein called Sporamin. Sporamin, was discovered in the 1930s and was hailed as a unique protein with anti-cancer effects. Scientists have tested the effect of this protein on cancer cells in a petri dish and they found that it is very effective against leukemia cells. Tests were also, performed on human tongue cancer cells and it was, revealed that sporamin is very effective in mitigating the viability of such cancerous cells. When this protein was tested on colon cancer cells, it was found that sporamin not only diminishes the growth of colon cancer cells but also their migration and invasion. Sporamin is not completely, digested by the body and is found in the blood intact. Generally, when proteins leak into the blood they commence immune response. Sporamin ameliorate cancer survival without actually activating the host’s immune system. Sweet potatoes are good for people with diabetes, which is opposite of the popular belief. As mentioned before, they are very effective in regulating blood sugar levels by aiding the proper secretion of insulin. This does not mean that you can eat rampant sweet potatoes, but it is indeed a healthier substitute for rice as your carbohydrate intake. Sweet potatoes are extremely nutritious and healthy vegetables. 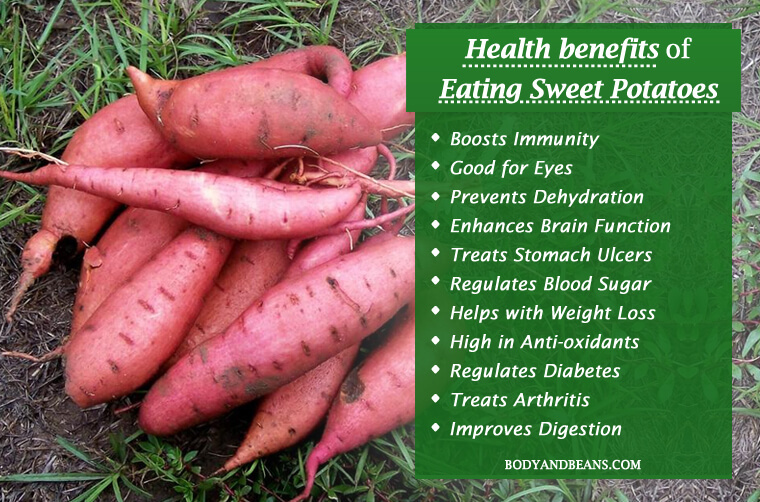 There are a number of health benefits of eating sweet potatoes. Eating sweet potatoes help you regulate blood sugar and keep your diabetes in check, boost immunity, improves digestion, boosts brain function, eye health and helps in weight loss. It also treats arthritis, inflammation, asthma, bronchitis, stomach ulcers and offers benefits in dehydration. Eating sweet potatoes are even beneficial in fighting against cancer. The iron in sweet potatoes, help improve the immune system and magnesium helps you to relax and eliminates stress. Sweet potatoes are also high in Vitamin B6, which reduces the chemical homocysteine in our body. Homocysteine has been, associated with several degenerative diseases like heart attacks. Sweet potatoes are easy to cook and can be cooked in various ways like you can bake it, fry it and you can even add them in soups, stews and smoothies. Although beneficial, sweet potatoes do have side effects. If you have history of calcium-oxalate kidney stones, you should avoid sweet potatoes. Calcium oxalate combined with sweet potatoes cause kidney stones. (Source: 4) Although rare, but sweet potato allergy is not unheard of. If you experience any symptoms like nausea, allergy, vomiting etc, immediately consult with your physician. The health benefits of eating sweet potatoes hugely outweigh the side effects. 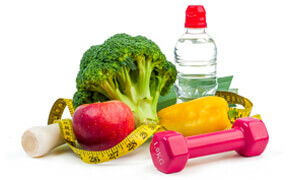 They are helpful for people who are trying to quit smoking, drinking or narcotics. The high concentration of Vitamin A and Phosphorus are good for both cardiac and ocular health. Have you tried sweet potatoes yet? If not, then add them to your diet today! Have you ever thought about writing an e-book or guest authoring on other websites? I have a blog centered on the same topics you discuss and would really like to have you share some stories/information. I know my readers would appreciate your work. If you’re even remotely interested, feel free to send me an email.